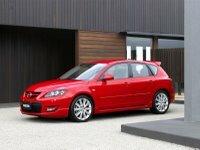 Well, the waiting is almost over for the highly anticipated high-performance version of the popular Mazda 3 small car. Coming to your local Mazda dealer later this year, the Mazdaspeed 3 (available in the 5-door hatchback body style only) packs the Mazdaspeed 6's turbo, direct-injection 2.3l 4-cylinder with over 250hp (final numbers haven't been released), routed through the Mazdaspeed 6's 6-speed manual transmission to the front wheels (250+ hp, under 3000lb car, front wheels only?...that could be fun, I guess). Helping get the power to the ground is a limited-slip differential as well as electronic torque control that works in the lower 3 gears to help balance turbo boost with the car's ability to use that torque. Safety equipment includes standard ABS, Electronic Brake-force Distribution, and Dynamic Stability Control. 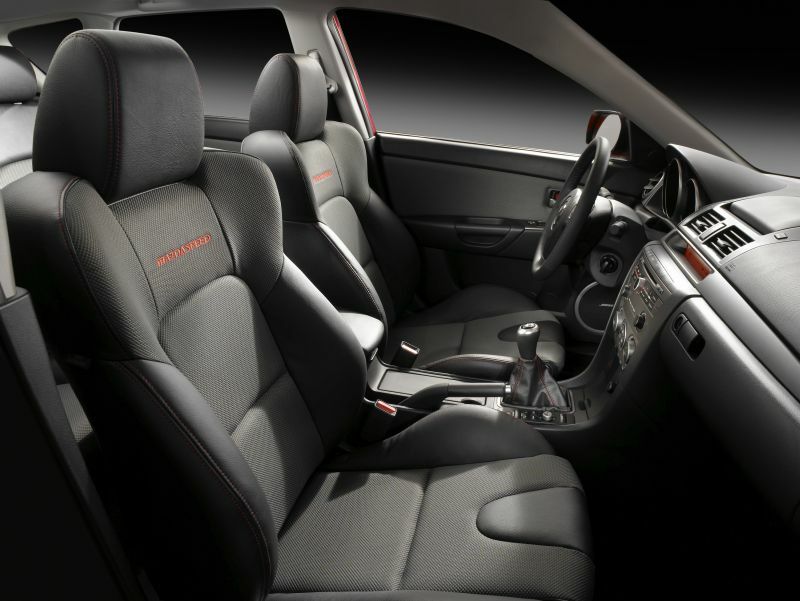 Inside, the Mazdaspeed 3 has aggressively bolstered seats with Mazdaspeed stitched into the seatbacks. Also expect a high level of standard equipment in keeping with the 'Mazdaspeed as flagship' positioning. 2007 marks a mid-cycle refresh for the entire Mazda 3 line and brings chassis stiffening to the beast of a 3 (in addition to wider bodywork, 18" wheels, and suitably high-performance tires). Even without AWD, the Mazdaspeed 3 looks to be an interesting addition to the performance small-car segment. It will be interesting to see how they choose to price this car (hopefully it will be significantly below the high-20's where the Evo and STi's play).